Welcome back, TDPS! Check out this issue for this semester's exciting upcoming events and all the latest School news. We have also received lots of new spring and summer job and internship notices, so browse those opportunities below. 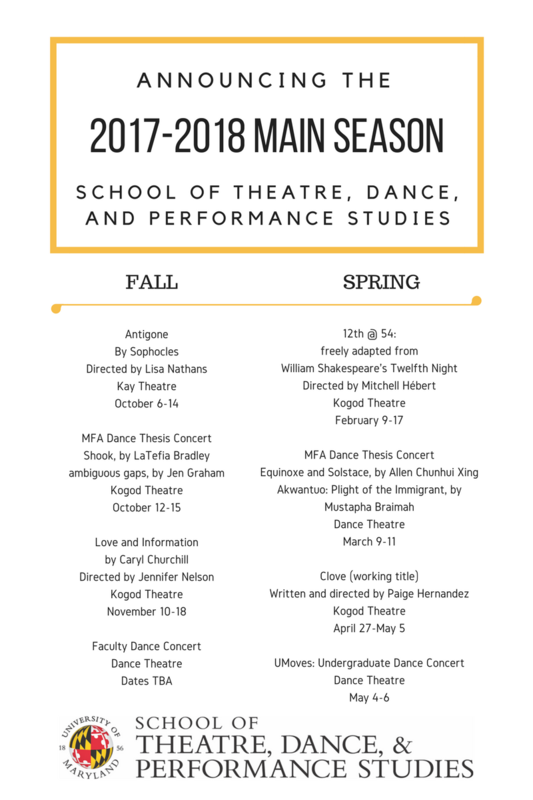 We also recommend reading The Chronicle of Higher Education's article "Why Theater Majors Are Vital in the Digital Age". We need art and arts research now more than ever! This multimedia project uses a live video loop that explores time as an architectural object; something to be controlled, built, expanded and repeated. Time as if it is poured like water: endless, flowing, emotional, momentous, pure. A wild and nostalgic investigation of what it means to give up the thing you love most, this performance seeks to uncover what makes New York City exciting and enticing to the natives and the dreamers. Part documentary, part mockumentary, part dance, part theater, part film — this love letter explores the exhilaration, freedom, fear and regret of actively witnessing the death of your youth. Company Wayne McGregor in Atomos. Photo by Ravi Deepres. January 28: Company Wayne McGregor presents Atomos, an athletic, sculptural modern dance performance, in which an ensemble of 10 artists mesmerizingly “atomizes” across the stage to a neoclassical score from ambient music duo A Winged Victory for the Sullen. February 4: Seven burgeoning choreographers will be featured in the 34th Annual Choreographers's Showcase, including MFA Dance candidates Colette Krogol and Matt Reeves with an excerpt of their thesis concert, Waking Darkness. Waiting Light. The Choreographer's Showcase is one of the longest-running showcases of new and established choreographers in the country. The spring, The Clarice will continue Small Business/Big Art, a series of moderated conversations with students and entrepreneurial artists in casual settings that reveal the new and changing ways artists create business models that sustain them both operationally and artistically. Upcoming events include: JACK Quartet (Feb. 9 & 11), Nouveau Classical Project (March 10), and Third Coast Percussion (March 29 & April 1). 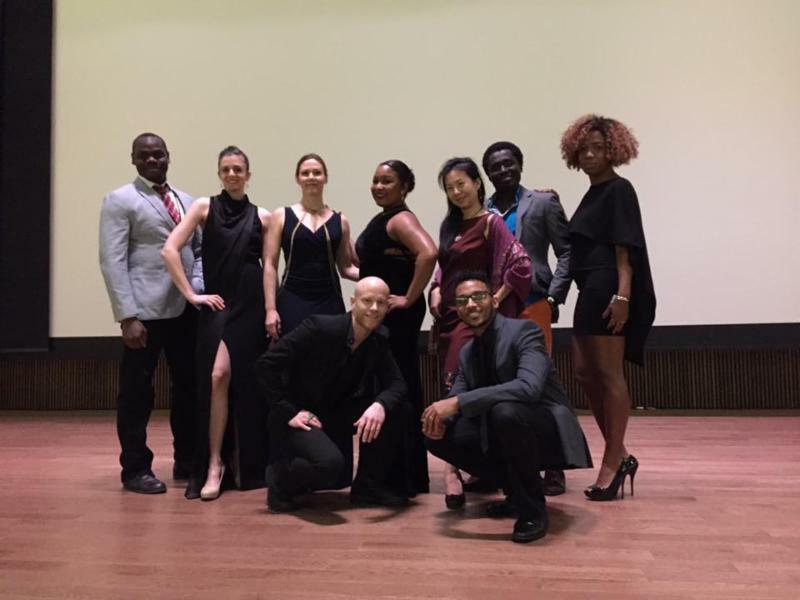 Dance students from the School of Theatre, Dance, and Performance Studies performed at the Busboys and Poets Annual Peace Ball: Voices of Hope and Resistance, held at the Museum of African American History and Culture on Thursday, January 19. The students performed “dances of resistance,” as demonstration of how dance helps individuals and communities find empowerment, agency, and voice. TDPS performers included Sinclair Emoghene (MFA Dance ‘16) and Ling Tang (BA Dance ‘07), and current MFA Dance candidates LaTefia Bradley, Mustapha Braimah, Stacey Carlson, Christine Hands, Ama Law, Chris Law, and Shawn Stone. Read more. Vietgone, projections design by TDPS Professor Jared Mezzocchi. Photo credit: Emon Hassan for The New York Times. 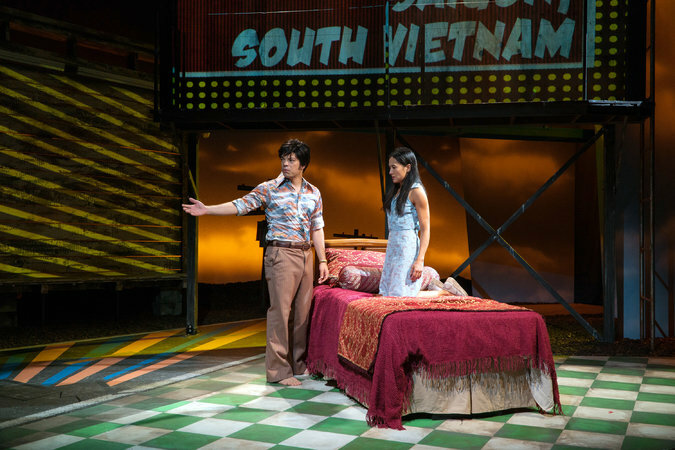 TDPS Professor Jared Mezzocchi was featured in the New York Times' "Memorable Theater of 2016" for adding "a hefty dose of biff-bam-pow" with his projections design for Qui Nguyen's Vietgone. Excellent work, Jared! TDPS Professor Scot Reese hosted two great conversations at the Kennedy Center over winter break. In early January, he lead a Theatre Look-In conversation with company members of Wicked; on January 15, he moderated the final performance of Bud, Not Buddy, which had its first reading with Scot's THET222 class. Theatre major Karen Dolle completed the lead in Wright Now Play Later program at Center Stage, which challenges playwrights to write plays based on prompts from social media. A video of Karen and her program cohort is available here. MFA Dance alumna Diedre Dawkins (‘10) received the President’s Lifetime Achievement Award / President’s Volunteer Service Award for her community work. Congratulations, Diedre! 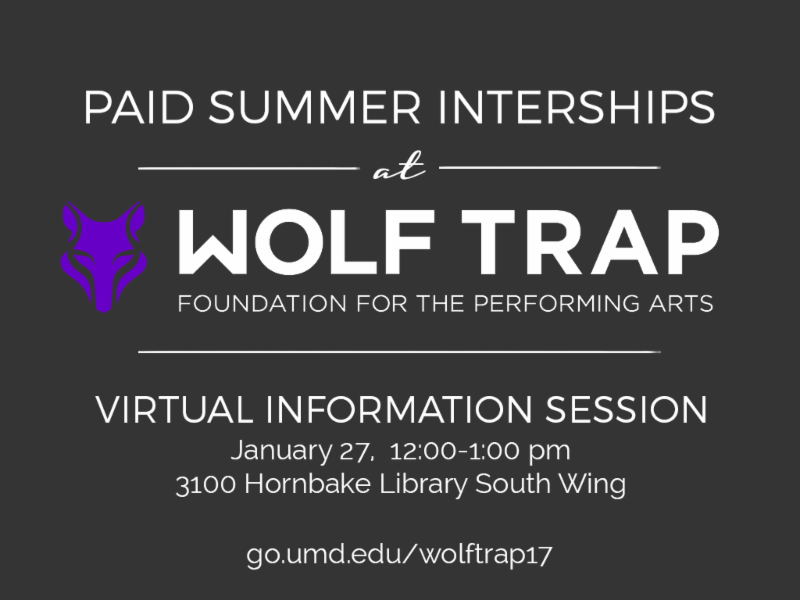 Attend a virtual information session with the Wolf Trap Foundation for the Performing Arts on Friday, January 27 at 12pm in 3100 Hornbake Library, South Wing. Wolf Trap's summer internship program offers paid opportunities in communications, graphic design, event planning, marketing, photography, development and more. Learn more about available internships here. Please RSVP for this information session at www.go.umd.edu/wolftrap17 and email Kate Juhl with questions at kjuhl@umd.edu. 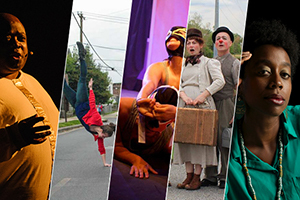 Are you a local performing artist who is interested in developing new work? Do you or your company want audience feedback on projects you are designing? Do you value input in your creative process? Apply to be a part of The Clarice's 2017-2018 NextLOOK series! Visit http://theclarice.umd.edu/nextlook to learn more about the NextLOOK series and its proposal requirements and to access the online proposal form. The deadline to apply is Friday, March 3, 2017. Decisions for the 2017-2018 NextLOOK season will be made in early April 2017. Script submissions for the 2017 Watermelon One-Act Festival (WOAF) are due on February 14, 2017. Please e-mail scripts and submission forms in Word format to watermelon@watermeloninc.org. Visit the festival website for rules, forms, and more information. Joe's Movement Emporium is looking for a creative student to serve as their Public Relations Intern. If you are interested, contact Neena Narayanan at 301-699-1819. Brave Spirits Theatre is seeking a non-equity stage manager for their spring repertory of 'Tis Pity She's a Whore and A King and No King. Rehearsals to begin at the start of February. Rehearsals and performances will take place at Convergence in Alexandria on nights and weekends. Please contact bravespiritstheatre@gmail.com if interested. SoulFly Theatre Society is currently casting for their 2017 winter production of In The Blood by Suzan Lori-Parks. They are looking for three men and two women. If interested, please submit your headshot, resume, and a 2-3 minute video recording of a dramatic monologue to soulflycasting@gmail.com. ArtStream seeks part-time Scenic Artists to support the artistic, production and acting teams of an ArtStream Inclusive Theatre Company. To apply, please e-mail a cover letter explaining why you want to work with ArtStream and a résumé to jobs@art-stream.org. Monumental Theatre Company is looking for female actors of color for its spring production of Five Lesbians Eating a Quiche. In order to be considered, please e-mail your headshot and resume to monumentaltheatreco@gmail.com. 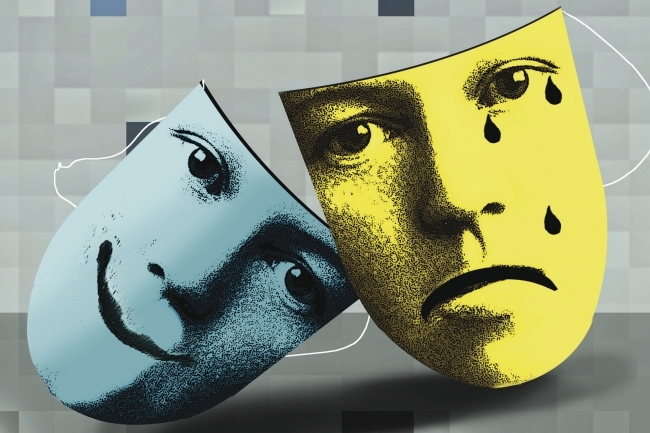 "Why Theater Majors Are Vital in the Digital Age"
Image by Michael Morgenstern for The Chronicle of Higher Education. "Theater (slow, communal, physical) may be the cure for what ails us in the digital world .... As technology and machines consume more and more of life, perhaps theater can help us remember what it means to act like a human."